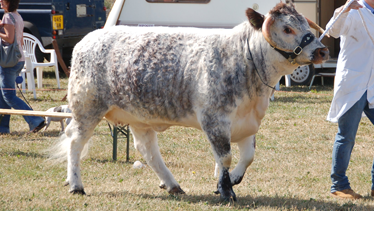 A most useful and hardy race of cattle, varying in colour from dark brindle through to pale roan, frequented Middle England hundreds of years ago. 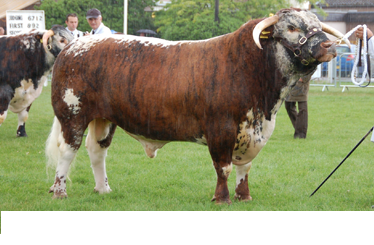 It was prized not only for its meat but also for the fantastic creamy white horns, which were treasured by manufacturers of buttons, cups, cutlery and not least lamps. farmers during the Middle Ages. They were destined however, to become the pride of England during the second half of the eighteenth century as providers of incomparable beef. The most usual method of cattle keeping in those early times would have been one or more animals belonging to an individual, kept on common grazing, which were served by a bull owned by the Lord of the Manor. It was all a most haphazard and unsatisfactory method. There was no possibility of an organised breeding programme being carried out. The peasant farmers had to put up with what the Lord provided. As a result, cattle were long in the leg, narrow bodied and coarse, ideally designed for the plough. This changed with the advent of the enclosure system. 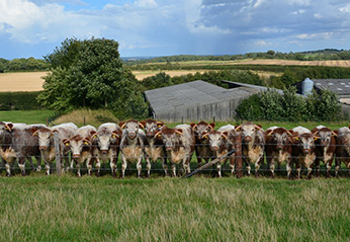 By the 1700’s Sir Thomas Gresley of Drakelow House, Burton on Trent was a noted improver of cattle. 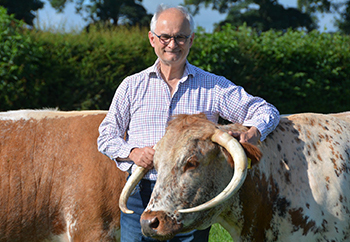 He ‘took such delight in keeping a dairy of Longhorn cows similar in colour and shape’. 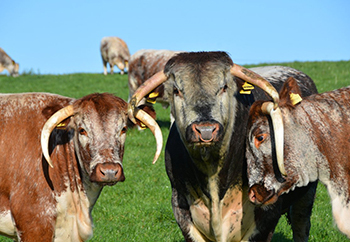 The ability to keep an enclosed herd and make one’s own decision on a mating programme became a most fashionable idea, especially among the upper classes. 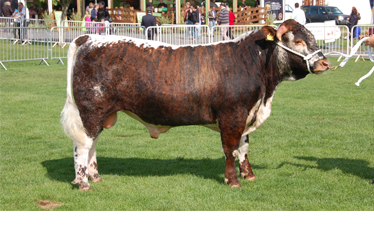 But a cattle breeding programme did not really materialise until the arrival on the scene of Robert Bakewell 1725-1795. He was a farsighted and knowledgeable man who became devoted to one aim. His desire was to improve every type of farm livestock, so that in turn he could provide meat for the masses of people who had flocked to the towns from the countryside to work in the Industrial Revolution. 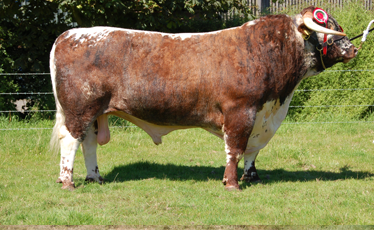 Producing animals for meat was itself revolutionary at the time but Bakewell had undauntable perseverance and he also had the rare quality of being able to ‘see’ cattle. This ability enabled him to pick the finest that were available to him and by using inbreeding, which increased genetic purity and uniformity it enabled him to fix the type for which he was aiming. 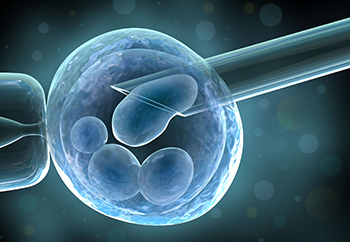 By breeding son to mother and father to daughter he achieved the results he was looking for and could then out cross them to distant relatives. 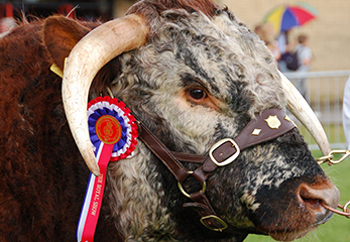 Bakewell was soon looking at his improved race of Leicestershire Longhorns. His ‘breed’ was now capable of providing the population with a carcass of two-fifths boil to three fifths roast and which finished in half the normal time taken to produce an animal for killing. Bakewell also developed the idea of progeny testing. He had a revolutionary method of hiring out sires to people in different parts of the country, thereby improving livestock on a national basis. 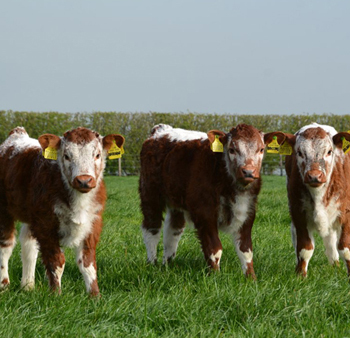 The development of the progeny test as a basis for a selection programme was a major contribution to the industry. 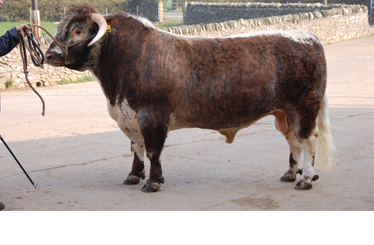 Along with other stock, his Longhorns became globally famous and were exported by him to many parts of the world. Sadly, at his passing there was no true heir to take on his mantel. 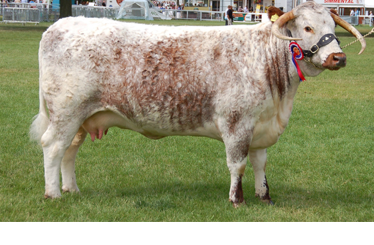 Devotees of the breed, through a catalogue of disastrous matings, trying to follow his ideas but lacking his knowledge, produced animals that gained a reputation for unthriftiness, poor milking ability and as uncertain breeders. 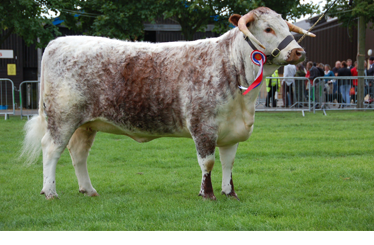 Many small farmers then turned away from the breed and switched to the newly fashionable Shorthorn but a few still clung to the good old breed as it awaited its second revival in the mid 1800’s. During the greater part of the nineteenth century, grand events trumpeted agricultural improvement and the Woburn Sheepshearing exhibited every facet of the industry at it brightest and best and fellow breeders would pit their skills against one another to produce the very best animals. 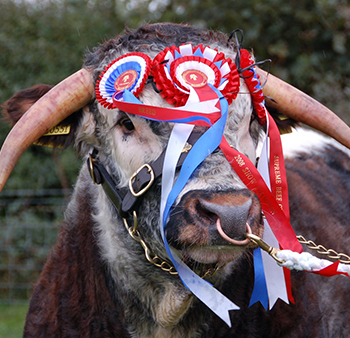 Longhorns were climbing up the popularity stakes again and took on challenges from other breeds to take top honours in many breeding, fatstock and milking competitions. 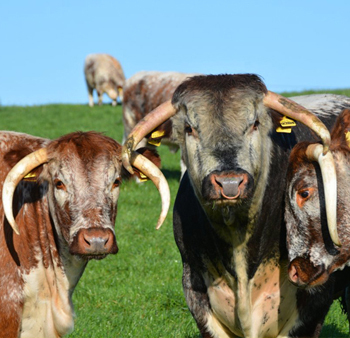 They were championed by such men as the Lord’s Howe and Westmeath and the Marquis of Queensberry, just some of those responsible for the formation of the Longhorn Cattle Society in 1875 and the production of the first Herd Book in 1878. 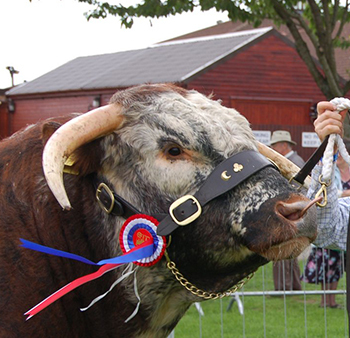 Blackbrook Longhorns – from ‘a most useful and hardy race’.